"For more than a year the Joint Chiefs of Staff have unanimously recommended to the President that fuel and oil stocks in North Vietnam be destroyed. They have strongly advised closing the Communist port of Haiphong; they will realize that North Vietnam is totally dependent upon imports to maintain its war effort. But while 200 American boys are killed in Vietnam each week by the highly mobile Vietcong, the President has refused the military permission to totally destroy these supplies. On orders from Washington, the Strategic Air Command is forbidden its primary purpose - strategic bombing - and is used instead against tactical targets in South Vietnam. Meanwhile, smaller tactical bombers and jet fighters are sent against supposedly strategic targets in the North. And, on orders from Washington, the Communists are allowed 'privileged sanctuaries' along Red China-North Vietnam border; in Cambodia; in Laos, including parts of the Ho Chi Minh trail; and in much of North Vietnam itself. 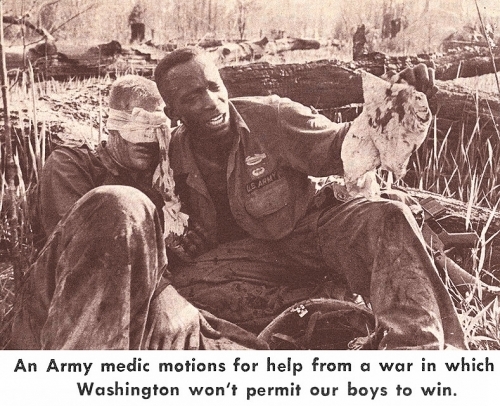 Many air fields, military installations, steel mills, ports, dams, power plants and other vital industries and installations go untouched in North Vietnam on direct orders from the politician who is our Commander-in-Chief - while brave men die."